So, I can only apologise that it has taken me a year to get down to visit Mrs Smiths Cafe in Jennyfields, what a cool place! 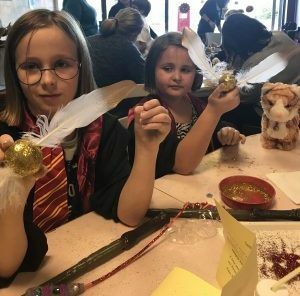 The Mumbler clan were lucky enough to be invited down to their special “Harry Potter” afternoon tea craft session in October 2017 which was run in conjunction with The Creation Station Harrogate. 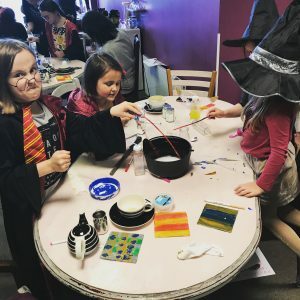 I wasn’t sure exactly what to expect, but we were treated to an absolutely fantastic afternoon of crafting followed by the most delicious array of Harry Potter themed food. The cafe itself is easy to find, located right next to the co-op in Jennyfields with plenty of parking. It’s a nice light bright space and is obviously extremely welcome to families. There was a dedicated toy area, where littles ones can play and I was seriously impressed with some of the personal touches, such as serving kids drinks in small lidded bottles with straws. Such a simple touch but one that makes the prospect of taking hurricane toddlers out in public a little bit more bearable. Both Mrs Smith (also known as Phillipa) and Mr Smith (also known as Harry Potter!) 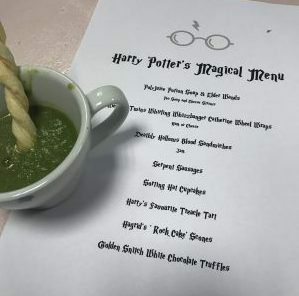 were working during the Harry Potter afternoon tea and spent the whole time, looking after their guests and ensuring that everyone had a lovely time. The crafting session was led by Sharon from the Creation Station. Upon arrival each child found a letter from “Hogwarts” welcoming them to the school and telling them the list of things that they should bring. The session then focused around making all of the items on the list. It was such fun! I won’t tell you exactly what we made as I don’t want to give it all away in case they run sessions again in the future however I will say that there were was a quiz, gluing, clay modelling, potion making and lots and lots of glitter! We all had an absolutely wonderful afternoon and I can’t recommend both Mrs Smiths Cafe and the Creation Station Harrogate highly enough. Both ladies clearly love what they do, and their enthusiasm and understanding of the local family market really shines. 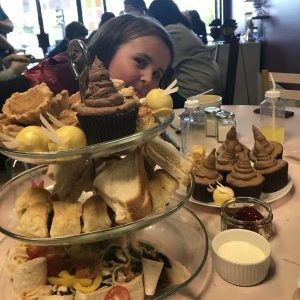 Disclosure: Mumbler was invited to attend the Harry Potter afternoon tea for free however this was not in return for any blogging or review services. I have written this review because I was so genuinely impressed with the event.